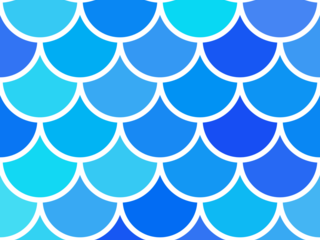 Patterns with scales that can be used for sea animals, fishes, reptiles and also mythical creatures such as mermaids and dragons. All the digital papers are available in very high resolution (3600x3600 pixels, 12 x 12 inches, 300 DPI), and all the digital paper packs contain the same pattern in more than 250 colors: Red, Pink, Purple, Deep purple, Indigo, Blue, Light blue, Cyan, Teal, Green, Light green, Lime, Yellow, Amber, Orange, Deep orange, Brown, Gray, Blue grey, White and Black, each in many different shades: light colors, dark colors, pastel colors, bright neon colors etc.). Try one of the 250 colors digital paper packs for free! Join the newsletter and instantly receive a FREE Digital Paper Arrows Pack with 250 free digital papers. The digital papers and files are for personal use or small business commercial use (only for handcrafted items - less than 250 items - no digital items - not suitable for print on demand sites like RedBubble, Cafepress, Amazon Merch and Zazzle). No redistribution of any kind is allowed. All the included digital papers, patterns, designs and files are Copyright 2018 Stéphane Gigandet. Sign up to the newsletter or join me on Facebook and Pinterest to find out about new patterns!